Use our comprehensive practice papers workbook and guide to prepare for your GCSE Maths Higher Papers. Up-to-date for the 2019 exams. If you are serious about passing your GCSE Maths Higher Papers, then this is the only guide you need. Are you about to sit your GCSE Maths exam? Are you currently revising all things maths? Are you worried that you don’t have enough revision resources? Well, look no further! Revised and updated for the 2019 National Curriculum, GCSE Maths is Easy: Practice Papers (Higher Tier) is the COMPLETE revision guide that will complement your academics and continuing learning. Brought to you by How2become – the UKs leading career experts and educational advisors, this guide is guaranteed to improve mathematical knowledge and enhance academic grades. This guide is suitable for GCSE Maths across all examination boards, including AQA, CCEA, Cambridge, Edexcel, iGCSE, OCR, Scottish and WJEC. THE LATEST MATHS REVISION GUIDE ON THE MARKET! COMPLIMENTING YOUR SCHOOL LEARNING AND IMPROVING YOUR FUTURE! How2become have ensured students are provided with the best practice materials to prepare for their exams. After all, practice makes perfect and the only way you can practice efficiently for exams is by undergoing similar testing questions. Our guide offers just that – packed full of testing questions, detailed answers and information regarding GCSEs and how to improve your scores. A must-have guide for every Maths student. Are you sitting the Higher Tier paper for the GCSE Maths exam? Do you know someone who will be sitting the GCSE Maths (Higher Tier) paper? If you answered, yes, to one of the above questions, then you are in need of our unique maths revision books to guide you through your Maths GCSE. The Higher Tier paper is a much more advanced level than the Foundation Tier Maths papers, and thus you need to revise and prepare to the fullest. You need to ensure that you give yourself, or someone you know, the best chances of securing a high grade; which is what GCSEs are all about, bettering yourself for a better future! WHAT IS INCLUDED ON THE GCSE HIGHER MATHS PAPERS? There is a significant difference between the Foundation Tier and Higher Tier papers of the GCSE Maths exam. It is important that you know which exam you or your child will be facing. Although it might not necessarily be a bad thing if you accidently revised topics from the Higher paper if you sitting the Foundation paper, because this will only increase mathematical ability and therefore improve your scores. Whereas, if you are meant to be sitting a Higher paper, and only practice questions at a Foundation level, you are in for a big shock! This will not prepare you, and will most likely affect your performance. Having a good understanding of the topics covered on the Higher Tier paper will go a long way in preparing you effectively for your GCSE exam. Above is just SOME of the common types of question that can appear in the Higher paper for the GCSE Maths exam. The list is not extensive and other questions types may apply. However, this gives you a great starting point in regards to what to revise for the exam. We’ll let you in on a little secret! There is one BIG advantage of sitting the Higher Tier paper as opposed to the Foundation. Although your paper is going to be noticeably harder and will require more complex calculations and long-winded questions, the one thing your paper can do that the Foundation paper cannot, is to get you a Level 9. With the Foundation Tier, the highest possible grade you can achieve is a Level 5. But, with the Higher Tier paper, you have the chance of securing a Level 9! There is not much more incentive than that! Your maths teacher will have spoken to you in regards to whether you should sit the Foundation or Higher paper, and thus, you would not be sitting the higher paper if your teacher did not believe you can reach a fantastic grade. That is why you should do everything in your willpower to obtain that high grade! You have been given the opportunity to “reach for the stars”. Why not see how far you can reach? Why not be the best possible version of yourself? Why not reach for success? REACH FOR THE STARS AND SECURE THAT A-GRADE! In order to shed light into the types of question that appear in our UNIQUE revision guide, we have provided you with 4 sample questions, taken directly from the book, in order to give you some indication as to what the Higher Tier Maths paper will include. 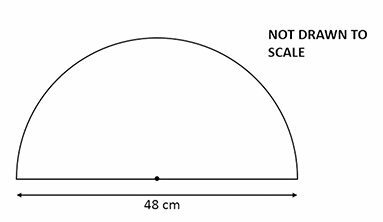 Below is a semi-circle which has a diameter of 48 cm. Work out the perimeter of the semi-circle. AB is a parallel to CD. Here is a triangle made up of three sticks. (a) Work out how many sticks will be in the next four patterns. (b) If n represents the number of sticks, and p represents the pattern number, write a rule that can be applied in order to work out the next pattern in the sequence. (c) Using your answer from (part b), work out how many sticks would be needed for the 118th pattern. Imogen wants to buy a large corner sofa, a foot stool and an arm chair. She is looking for the best prices. She browses on the internet, and has narrowed it down to three possibilities. 20% VAT needs to be added to store C. This does not include postage. VAT has already been included in Store A and Store B’s prices. Work out the best value for Imogen. Step 1 = work out the circumference of the semi-circle. Step 2 = the perimeter is half of the circumference. Step 3 = add the diameter. (Two extra match sticks get added to every sequence). Therefore Store C offers the best deal. NO EXAM IS TOO DIFFICULT! No exam is too difficult so long as you practice and prepare effectively. Education challenges students in such ways that it allows them to prosper and succeed! 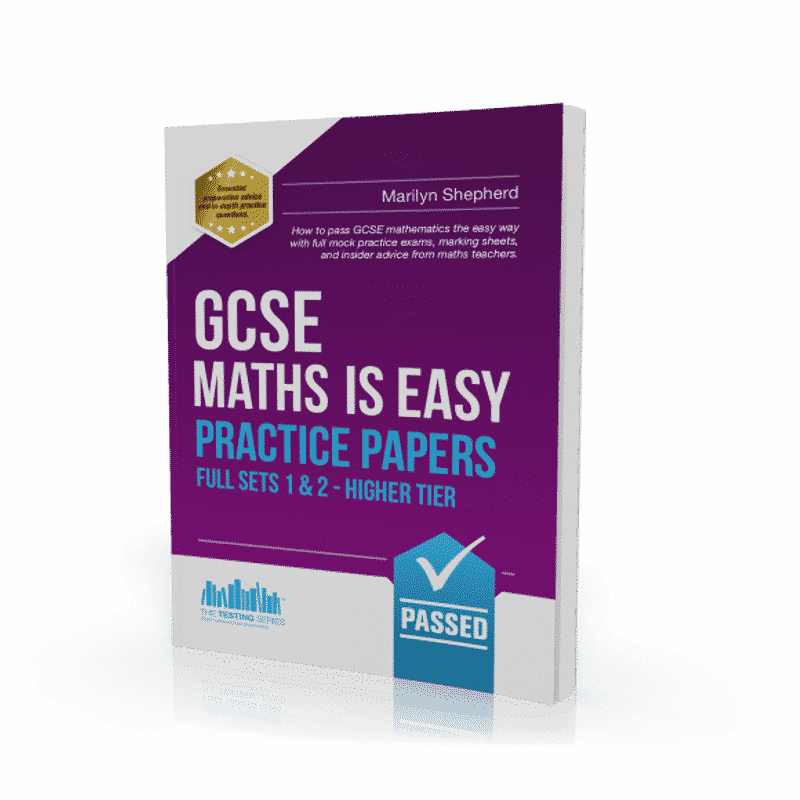 With the help of GCSE Maths is Easy: Practice Papers for the Higher Tier, you will go away feeling more confident, more at ease and more knowledgeable in regards to mathematics. By preparing for every eventuality and practicing ample testing questions, you will be able to face your GCSE Maths exam head on, without any fear or hesitation. The IDEAL book to guide you through the journey of GCSE Maths. Whether you use the guide to work alongside your class work, or just want that extra practice, this guide will not disappoint! This book has been carefully designed to replicate what students will ACTUALLY be facing in their real GCSE Maths assessment. Revised and updated for 2019 – An up-to-date guide that provides you with all of the resources you will need to complete the GCSE Maths Higher Tier exam. 2 full mock exams for the Higher Tier – Two sets, each with a Calculator and Non-Calculator paper. Detailed marking scheme – A mark scheme to show you how to reach the answer to every question in the book! A MUST-HAVE Guide – A revision book worth every penny! For the Higher Tier paper, this guide will ensure that you are equipped with great testing questions to aid you through your exams. Formatted in EXAM style!– We have purposely formatted this guide in a similar way to your REAL exam. This is to allow you to make the most out of your preparation and become familiar with exam layouts. Detailed Instructions – Not only does this guide provide sample questions, but we have also provided vital exam information at the beginning of this book to give you advice, instructions and top tips to prepare for your GCSE. Guidance for GCSEs – A complete survival guide to assist you in your preparation for your GCSE Maths exam for the Higher Tier paper. The COMPLETE Practice Papers – packed full of exam instructions, guidance and preparation tips, two full mock Higher Tier practice papers, and a marking scheme to show you how to work out your answers. 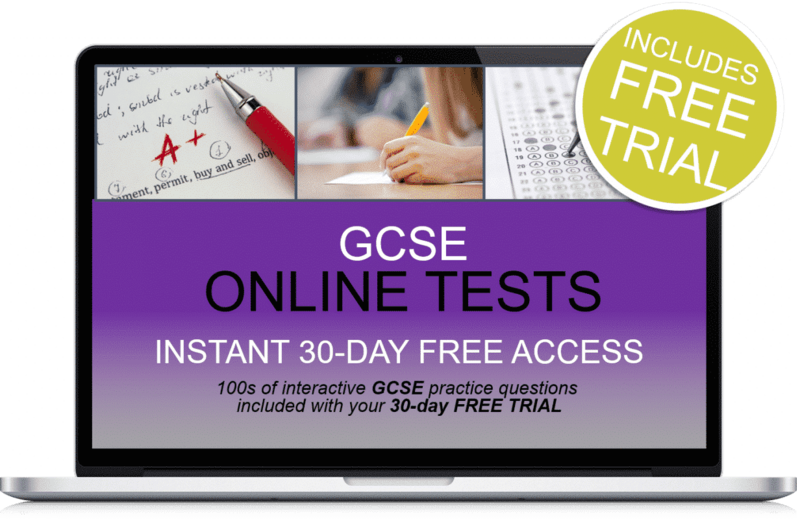 Plus 30-days FREE ACCESS to the GCSE maths online testing suite. Thereafter, just £5.95 +vat per month. No minimum term. You may cancel anytime. Cancel before the 30-days are up and you will not be charged. Guidance and top tips from maths teachers for GCSE Maths.